Walter A. Jackson has many firsts, and some of those firsts opened doors for others to follow. Born in King’s Mountain, North Carolina, Jackson grew up in Durham, North Carolina before he entered the University of North Carolina in 1963 as one of a handful of African-American students at Carolina. When he graduated from the School of Journalism in 1967, he was the third African-American student to graduate from Carolina with a degree in journalism. After graduating from college, Jackson joined the U. S. Army and served in Vietnam as a combat infantryman and a public information specialist. He continued to be trailblazer when he returned from Vietnam as he pursued his craft and became the first full-time African-American news reporter for The Herald-Sun in Durham. Coupling that position with work as a reporter for The Charlotte Observer made Jackson one of the first African-American reporters for predominantly white news organizations in North Carolina and in the South. He went on to earn a master’s degree in public administration at Harvard University and completed additional study at Georgia State University and UNC. Jackson worked in a variety of positions, including public relations at Gulf Oil, the staff of the governor of Georgia, manager of the Atlanta office of B&C Associates, and public information officer and affirmative action administrator for the City of Durham. His career path also included tenure with BP oil and gas company in Cleveland, Ohio, and Salt Lake City, Utah; and as human resources administrator for the Durham Housing Authority. Jackson’s work includes several businesses that he established, including Ideas! Coffee House in Durham. Wherever he has lived, Jackson has volunteered with food pantries and organizations that help the homeless and youth. He has served on many boards and committees and received a myriad of awards for his civic and community service. 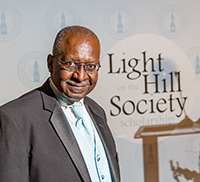 Jackson has served as a long-time Black Alumni Reunion committee member, spearheading the UNC Black Pioneers and serving many years as its chair. Jackson said that enrolling at, attending and graduating from the University of North Carolina had a profound effect on his life. He credited Carolina for broadening his horizons, giving him the skills and confidence to interact with people different from those he knew growing up in a racially segregated and isolated working-class community in Durham. “It was the beginning of a new day for me,” Jackson said. “That time was also the beginning of a new day for our country, as I and other African-American pioneers were not only in the vanguard of breaking down the walls of segregation in education, but we went on to be in the forefront of change in government, business, communications, military service, law, politics, the medical field and in many other ways that were crucial to the remaking of America.